The thermostat on our boiler died a while ago and more recently the communication box also refused to function. If we wanted heat it was a case of gingerly prodding the boost button on the communication box and hoping it didn’t fall off the wall. One cold Monday the boost button refused to work and Matt and I decided it was high time to do something about it. 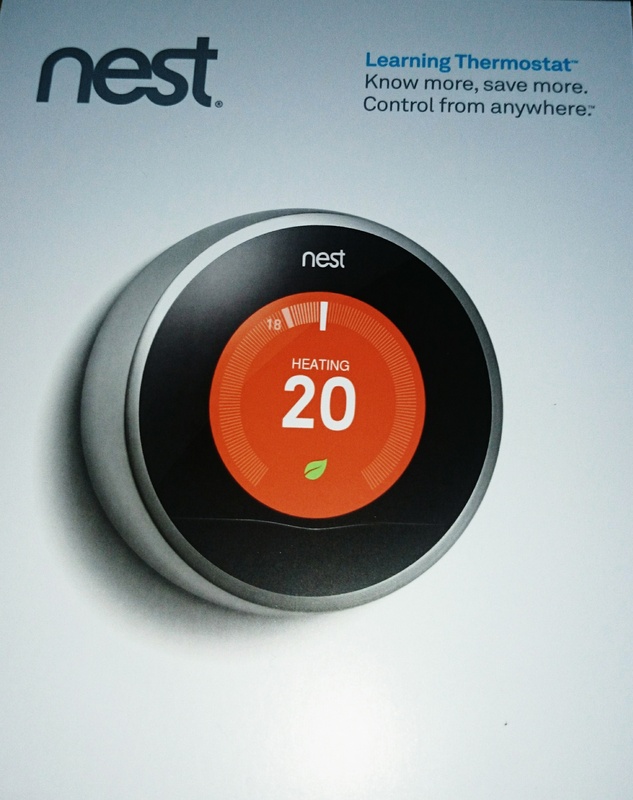 We had both been considering ‘nest’ a thermostat which can be operated by an app on a smartphone or manually on a device that looks a little like an old fashioned fire alarm only smoother and sleeker. Nest is supposed to learn about how long it takes for the house to heat up, when people are in the house and also rates energy consumption and offers advice. All of this information nest takes a month to digest and to gain a complete understanding off. The results can be viewed on a graph. A small green leaf is displayed when the temperature selected is considered an energy efficient temperature. When nest was initially installed 19.5 degrees c was a green leaf symbol but now the leaf isn’t shown above 18 degrees c. Perhaps this is because to keep the house at 19.5 the boiler needs to keep firing making it not so ecologically efficient. I do like the fact I can sit in bed and turn the heat up downstairs ready for when I venture down in the morning to make cups of tea. Matt likes it because he can make the house really toasty for when he arrives home at night. I will be interested to see what our energy bill is like this month, I have a feeling nest probably won’t be saving this drafty big house any money on it’s bills whilst it tries to maintain a constant ambient temperature, a bit like trying to keep water in a sieve. Perhaps it’s time to look at some more ways of stopping the house loosing heat.